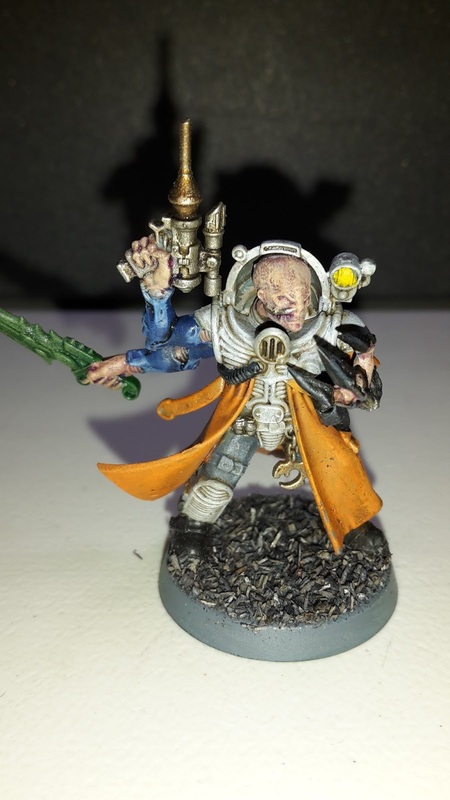 My Astra Militarum Codex Review continues with a look at the Troops choices available. This will be a quick one, as there are only a few options in this section of the codex. 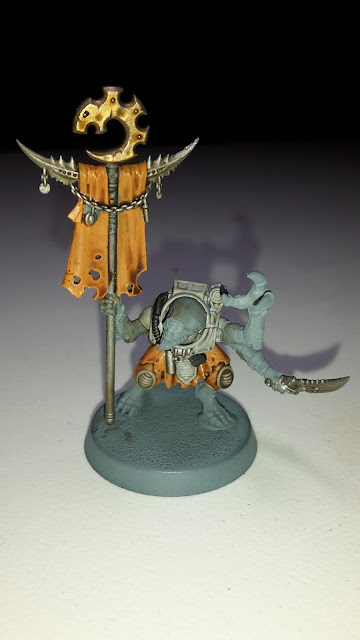 From a background perspective, these squads should make up the bulk of any Guard army. As such, they have a fair amount of variety in how they can be built. 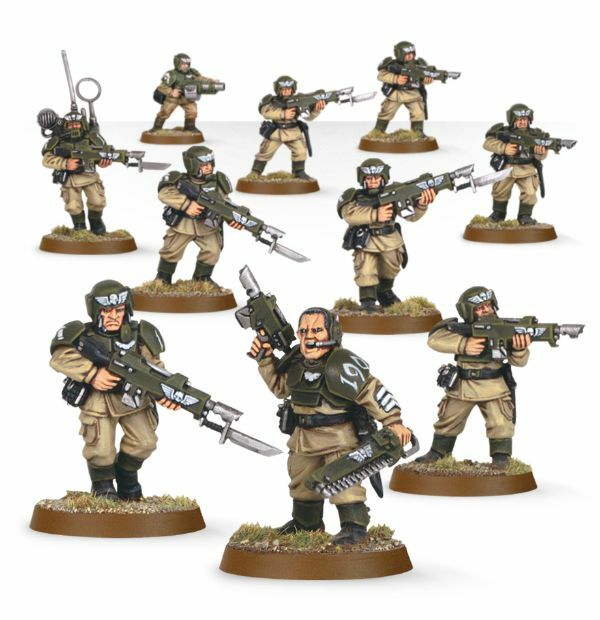 As standard, each squad consists of 10 Guardsmen (including Sergeant) and have the general Guard statline as they have for many editions. 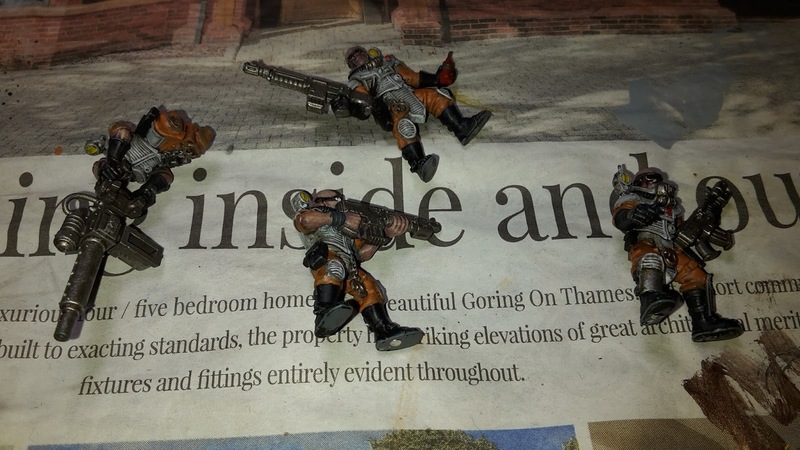 As usual, one Guardsman can take a special weapon and two can form a heavy weapons team. The Mortar has proved incredibly popular in 8th edition so far, but I think most of the Heavy Weapons can be of use in a Guard squad. The vox-caster is also a great addition to take, extending the range of orders to 18" if both squads have one and one is in range of an officer. Annoyingly, the Sergeant still doesn't have the option to take a Lasgun, meaning you will still have at least one laspistol in the squad, slightly reducing the number of shots a little in each squad. 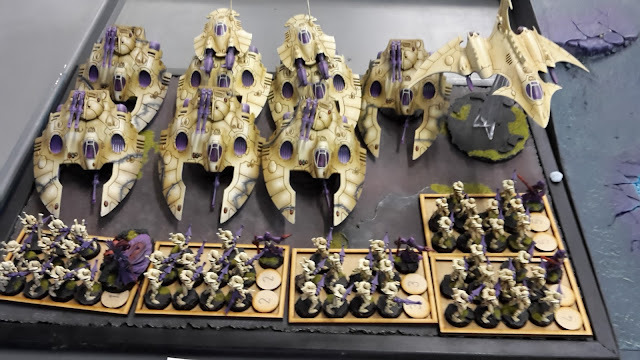 This squad will probably make up the bulk of my army, as it has in previous editions, and has gotten a bit cheaper to field, meaning I can squeeze more points out of my army for the big extras, such as tanks and flyers. 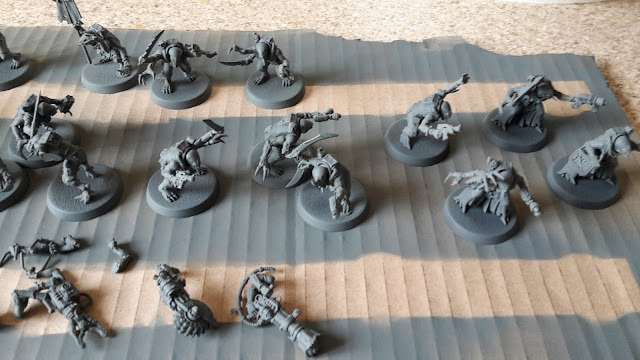 A downside of this squad is that it is harder to form combined squads in 8th edition without spending command points on them (bit of a waste for me). This means that your orders will not go as far as they did in 7th editions and gives you more deployment drops in most cases, decreasing your chances of going first in many games. 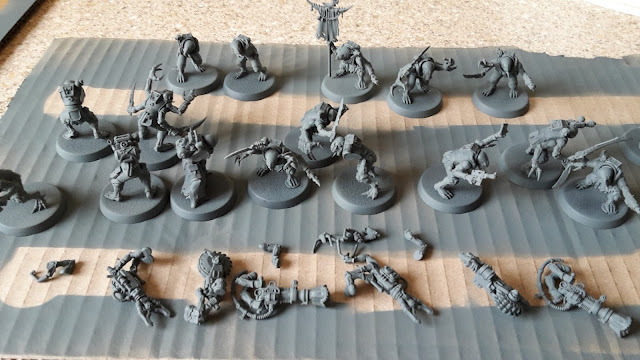 You are not going to find any close combat monsters or characters able to decimate entire swathes of the enemy army in the Astra Militarum HQ section, but you will find some great characters for buffing your seemingly weak Guard units to help them perform better on the tabletop. Creed is a great buffing character and warlord to have for a Cadian Force. He has a fairly modest statline, hitting on a 3+ in combat and in shooting. He comes with two hot-shot Laspistols and a power sword, so should be able to do a bit of damage against weaker infantry. He is T3, with 4 wounds, a 4+ armour save and 5+ invulnerable save, so is not the most durable. Where he does excel is the buffs he provides to the army. Having Creed in a battle forged army as your warlord gives you two bonus command points. Given the number of command points a Guard army can wrack up, this is a nice additional bonus to have. Creed also gets to issue 3 orders per turn and each order has a range of 12”, a nice boost over normal orders, allowing you to influence more of the battlefield. At only 70 pts, he is a really nice addition to the army and should prove very useful to include. As with all Relics, if your army is battle forged, one of your Characters may take one for free (only replacing an existing weapon type you may have to purchase). The Emperor's Benediction- A Bolt Pistol with three shots at AP-1 and 2 damage, that can target characters even if they are not the closest. This is a weapon for Commissars or Lord Commissars, and could be useful for causing a few wounds on weaker characters. The Laurels of Command- For an officer with the Voice of Command. When they issue an order, on a 4+ the bearer can immediately issue a different order to the same unit. This is a great Relic, potentially doubling the number of orders your officer can use in a single turn. This will be most useful on a Company Commander to maximise the use, especially when combined with Master of Command. The Deathmask of Ollanius- Gives the infantry bearer a 4+ invulnerable, and once per game allows you to heal D3 wounds at the start of your turn. This would be very good for your army warlord, giving him added protection over his regular invulnerable save, along with some nice healing potential once per game. 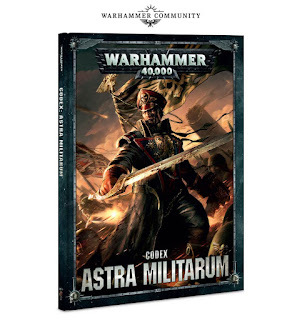 Part 2 of my Astra Militarum codex review will look at the new Stratagems available for the army in 8th edition. Vortex Missile (3CP)- Allows you to re-roll failed to hit rolls for a Deathstrike missile and gives you +1 to hitting nearby units (so hitting them on a 3+). In addition, if a model is wounded, but not slain, it does a further D6 mortal wounds on a 6+. A pricey Stratagem, but really makes the most of your one-shot Deathstrike missile. May be worth it if you get to fire the missile early, but you are unlikely to have too many command points left as the game goes on, and may not be saving them for this. Fire on my Position (3CP)- Used when the last model is slain from a unit with a vox-caster. 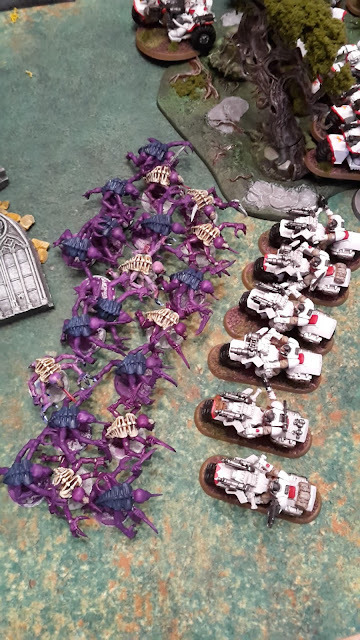 Roll for each enemy unit within 3" of the last model, on a 4+ they suffer D3 mortal wounds. Decent enough, but quite expensive at 3CP. You are probably only going to be in range of a unit or two most of the time, so two 50% chances at mortal wounds for 3 command points seems a bit expensive to me. Crush Them! (1CP)- A vehicle can charge even if it advances and hits on a 2+ in the fight phase. 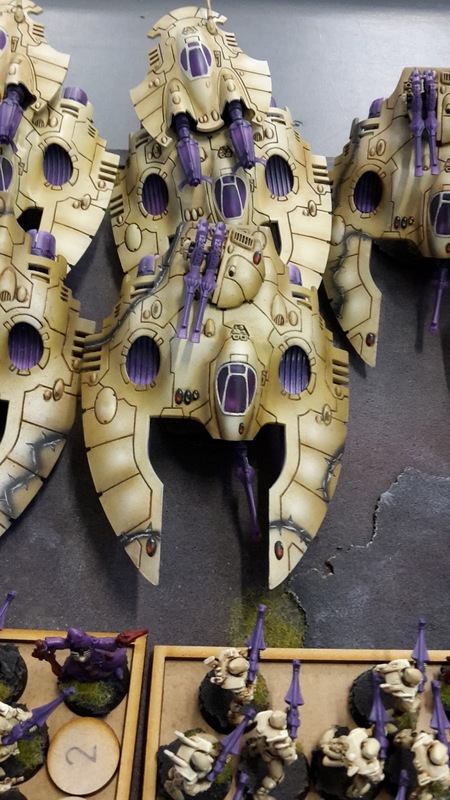 This is a really good stratagem for your Astra Militarum vehicles. On a Leman Russ, you will be getting three S7 attacks hitting on a 2+, which can be useful for taking out tough enemy units. This becomes an amazing stratagem on Superheavy vehicles. A Baneblade will be getting 9 attacks at S9, -2AP and D3 damage each, all hitting on a 2+ with this stratagem. 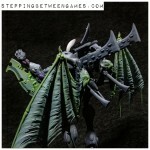 This will be awesome on a superheavy, and a bargain at one command point. Welcome to the first part of my Astra Militarum Codex review for the new 8th edition codex. The Imperial Guard are one of my favourite armies and I started a force of them a good few years back. Let's see what the new edition has in store for them. This first part will take a look at the army special rules (including orders), the Regimental Doctrines and Warlord Traits. This special rule allows selected character models to issue orders to Guard infantry units within 6" that are in the same regiment. Unlike previous editions, these orders are issued automatically, rather than requiring a Leadership test (unless they are conscripts, who need a 4+). This makes them much more reliable and easier to factor into your gameplan. Also, the changes to the rules for targeting Characters means it is easier to keep them alive for longer, meaning your orders will generally be more useful over the course of the game. Each unit can only be ordered once per shooting phase (with some exceptions as we will see below). Take Aim!- You can re-roll To Hit rolls of 1 in the shooting phase. Useful for boosting the accuracy of many of your infantry units. 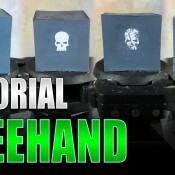 Could be useful on an Infantry squad for massed Lasgun fire or for giving your Heavy Weapons Teams a bit more accuracy. This is quite a good benefit, as Guard Characters tend to lack the re-roll 1's to Hit bubbles that characters in many other armies get. First Rank Fire, Second Rank Fire!- One of the most popular orders used and with good reason. This makes all Lasguns and Hot-shot Lasguns Rapid Fire 2 in the shooting phase. This is great for getting 36 Lasgun shots at close range to try and hurt an enemy unit (still no option to give a Sergeant a Lasgun unfortunately). The downside is that it is harder to make combined squads in 8th edition without using up Command Points, so no using this on a 20 or 30-strong Guardsman squad (though you can still give it a try with Conscripts). I can see this one being just as popular as it ever was. GW have just released a new errata and FAQ based on the new Astra Militarum codex. If you haven't seen it, you can find it on the following link. 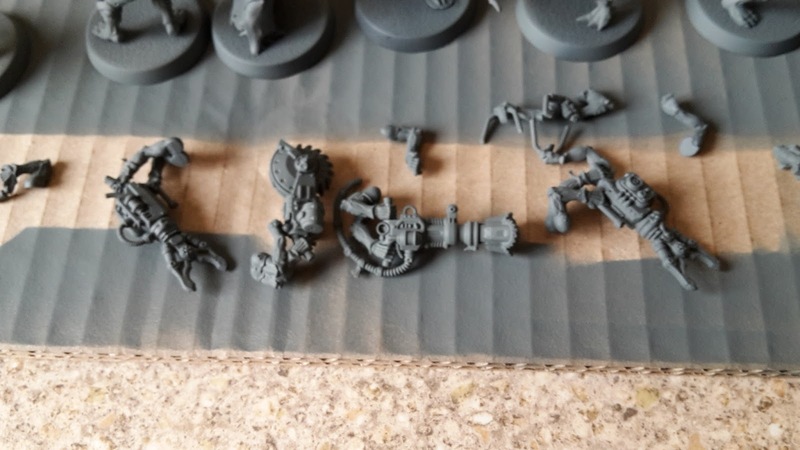 I don't normally post about these, but there were a couple of things that caught my interest and came at a good time as I was working on my Codex review. The first major one is the change to Commissars. Under the old rules, Astra Militarum units within 6" of a Commissar could never lose more than a single model as a result of a single failed morale test. 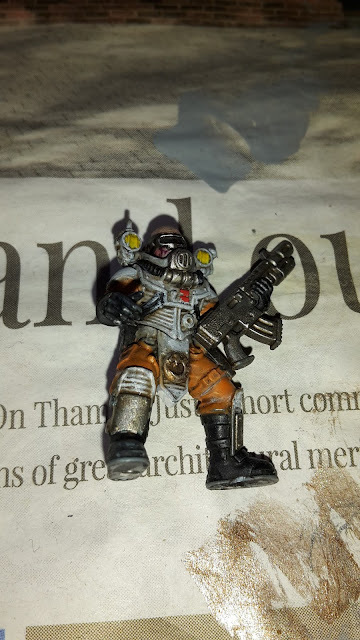 Under the new rules: "The first time an Astra Militarum unit fails a Morale test during the Morale phase whilst it is within 6" of any friendly Commissars, one model of your choice in that unit is slain and the Morale test is re-rolled (do not include this slain model when re-rolling the Morale test)." This has big implications for Conscript spam units in the game. 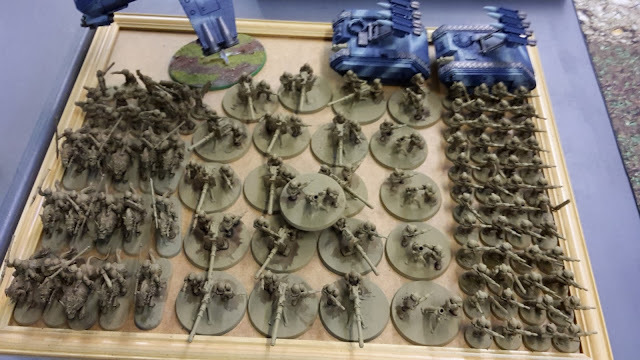 Previously, if you were to wipe out half of a 30-strong Conscript squad, they could only lose a single model to morale. Now, however, you are only getting a re-roll for the cost of a single member of the unit rather than "automatically passing". This is a big change meaning that morale will have a big effect on these units and other Guard units in the game. I think this is probably a change for the better, making conscript mobs much more likely to fold under intense firepower. In fact, most of the time you are probably better off not including a Commissar in your army. The rule states that you must lose a single model and re-roll the test. This could be more detrimental in a lot of situations. For example, say you fail a morale test on a 1 or a 2 and would lose a single model from your unit. 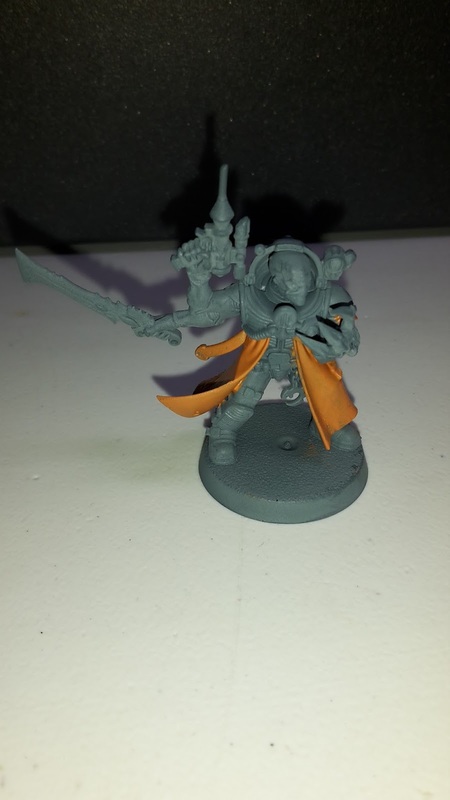 If there was a Commissar nearby, you would be forced to lose a single model and still re-roll the morale test, potentially losing even more from your squad. 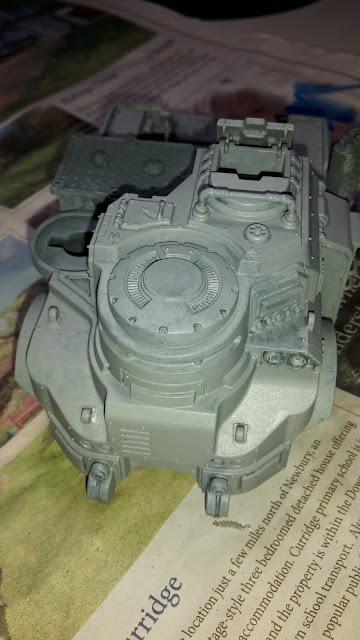 The other big change for me was that Genestealer Cults armies now use the new Grinding Advance rule for their Leman Russ tanks, allowing them to fire twice if they remain stationary or move below half speed. 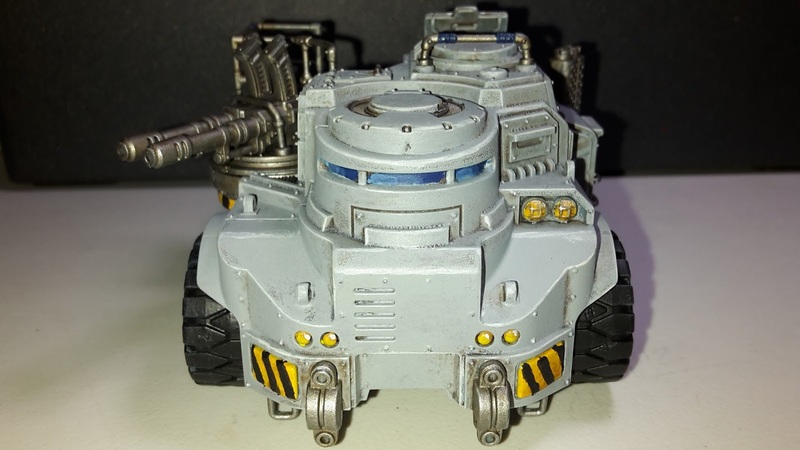 As I was planning on adding a Russ to my army, this is a great boost for them, giving them much more firepower. It is a little annoying that my brand new Astra Militarum codex that is less than 2 weeks old is already out of date, but I do appreciate the speed with which they are fixing things. What do you think of the new FAQ? 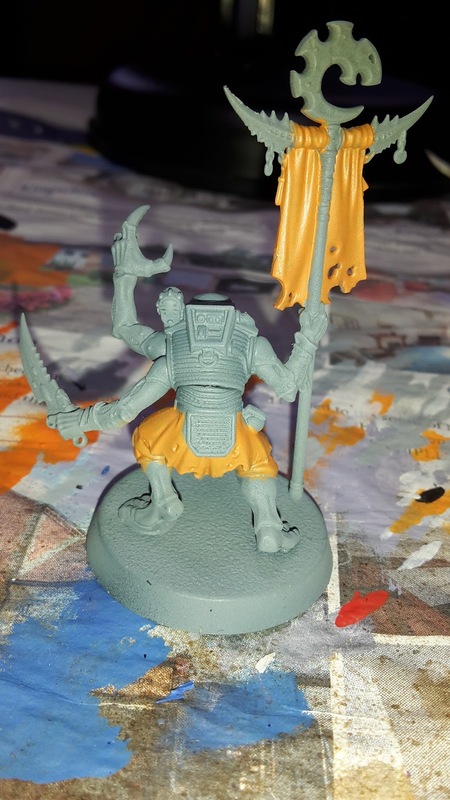 Is it going to improve things in competitive 40k without conscript blobs tying everything up. Hi everyone, today's posting is just a list of random musings on what I am working on at the moment and what will be coming up on the blog in the near future. First up, this weekend I am planning to make a start on my Codex Astra Militarum review. I purchased this book on the weekend it was released and have been enjoying reading it and seeing what it will bring for my Guard. Not sure if I'll do a fully review of every section of the book, as there are a lot of options available. Each hour I spend writing the review is one less hour for hobby work. However, knowing me, I'll probably do a quick full review anyway. 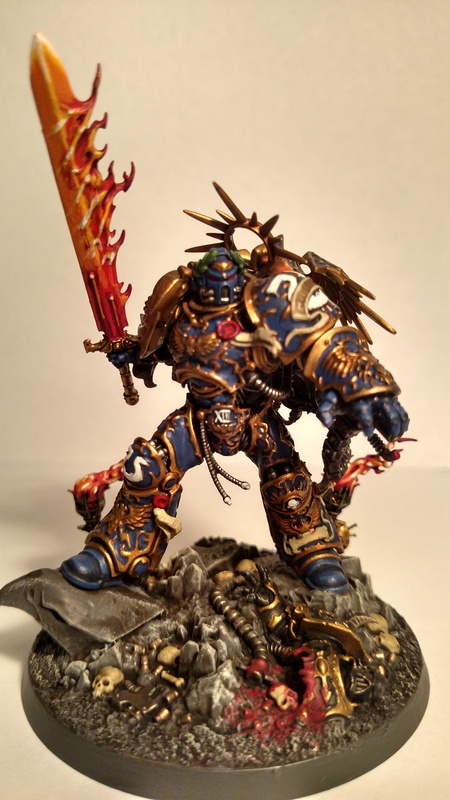 I am also to write up a few more Space Marine reviews for Frontline Gaming this weekend. 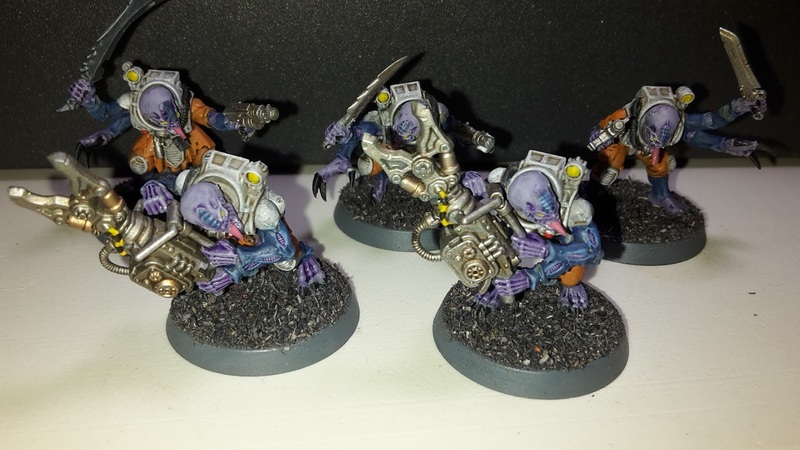 Today's Hobby Update sees the completion of my second HQ unit for my Genestealers Cult army, the Primus. 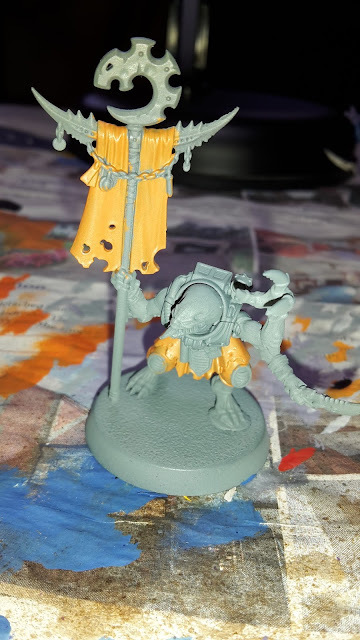 Here are some WIP shots of the Primus and the completed model. A quick post today showing some random photos that I took at the Bunker War tournament before I left Newcastle. Hope you enjoy. 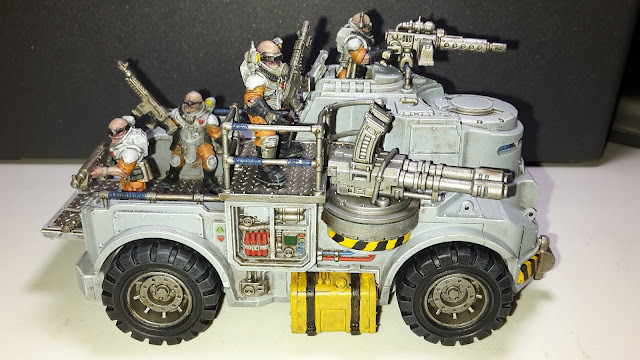 This week, I was able to finish up the crew of my first Goliath Truck for my Genestealers Cult army. I had magnetised the crew to allow them to be removed during transport or to remove them when the squad inside has disembarked. 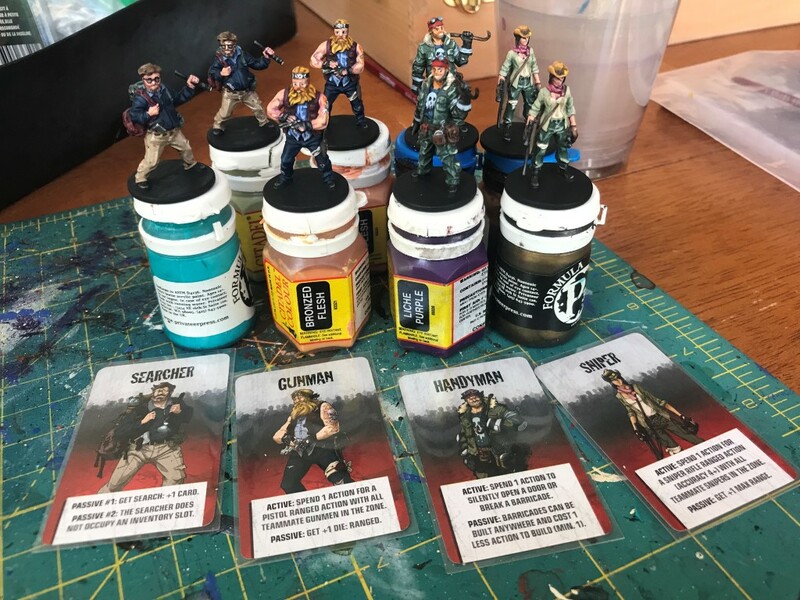 Here are the WIP shots on the crew and the completed model. Another hobby update this week, as I started work on one of my Goliath Trucks for the Genestealers Cult. 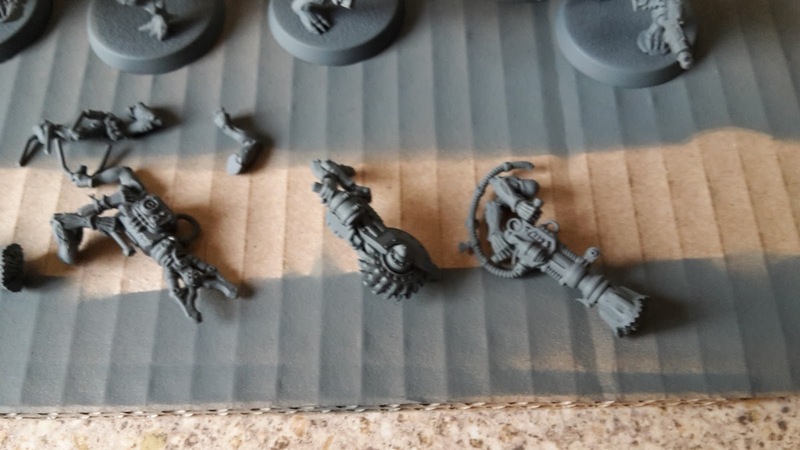 I decided to magnetise the crew of the Goliath so that they could be removed. This was for two reasons. The first was that it would allow me to remove the passengers when the squad inside disembarked, or to use other models to represent the squad being transported. Second, these models are the most likely to be snapped off or broken when transporting the vehicle, so this would reduce the odds of that. It would also allow me to paint the crew separately from the main body of the truck. I will post an article on magnetising the truck in the coming weeks (I am currently magnetising a Rockgrinder and will include this in one article), so this will just show the painting progress so far. The truck was actually quite easy to paint up, following a similar method to painting up the infantry models in my army. 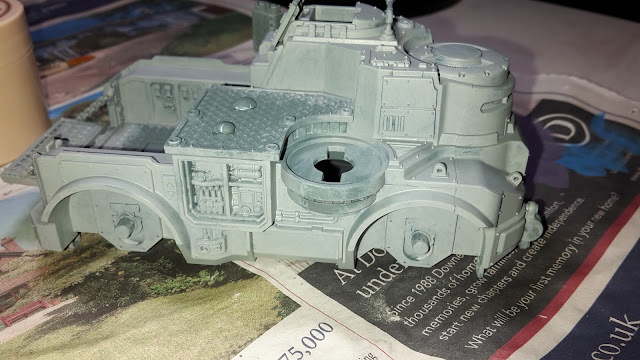 Here are some WIP shots of the painting and the completed Truck model. This week's battle report sees the first outing for my Dark Angels Ravenwing army in 8th edition, taking on Adam's Necrons in a 2000 pts Eternal War mission. This game was fought at a tournament at Battle Bunker in Sunderland. I was not planning on attending the tournament, but Justin (who runs Battle Bunker) put out the call on facebook the morning of the tournament. He was one player short and needed someone to make up numbers. Two free games of 40k awaiting, so I showed up for round 2 and was placed at the bottom table as if I had lost the first game. I decided to try out my Ravenwing in 8th edition, so made up a list to test a few units. 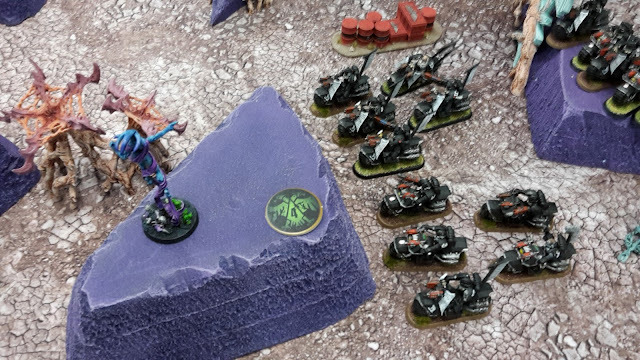 Two Outrider Detachments allowed me to take an all Ravenwing army. Sammael is a tough character in combat (doubles his strength on the charge) and allows full re-rolls for Ravenwing units. Two units of Black Knights would also be a potent force, as their Plasma Talons and Corvus Hammers would prove to be potent in combat and the shooting phase. I then took three units of Bikers, each with different special weapons. I took a Librarian and Apothecary to provide some useful psychic boosts and potentially heal some Black Knights. Finally, a rounded out the army with a Darkshroud (who provides -1 to hit against nearby units), a Landspeeder for some tank hunting and a Dark Talon. Two Hurricane Bolters combined with Strafing Run (+1 to hit) should provide a lot of anti-infantry firepower, and the Rift Cannon would also be good for hunting monsters and vehicles. My warlord was Sammael, who took Tenacious Survivor. Another hobby update this week with the completion of my first HQ unit for my Genestealer Cults army, the Magus. 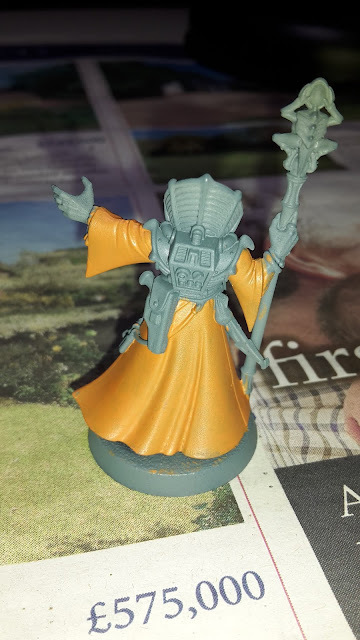 This model was quite easy to get painted up, as most of it is covered by the robes. I tried to keep to similar schemes to match the rest of the army. Here are some WIP shots of the model and the completed model photos. 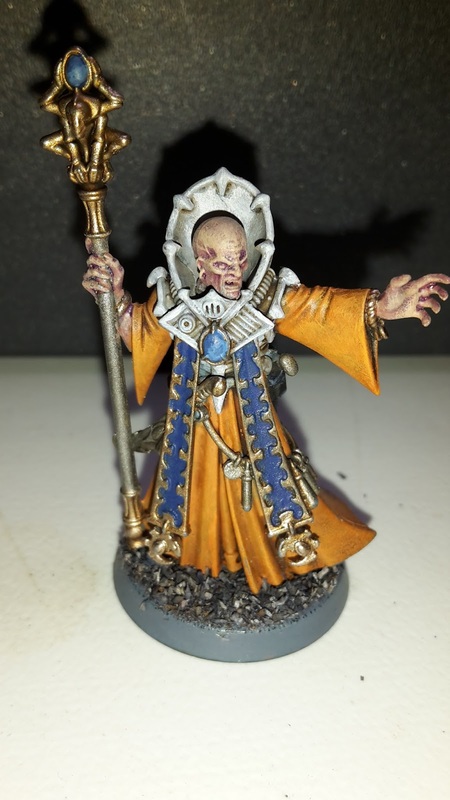 This week's hobby Sunday features another completed unit of Genestealer Cults Acolyte Hybrids. This unit was built with a pair of Rocksaws and Rock Clippers. 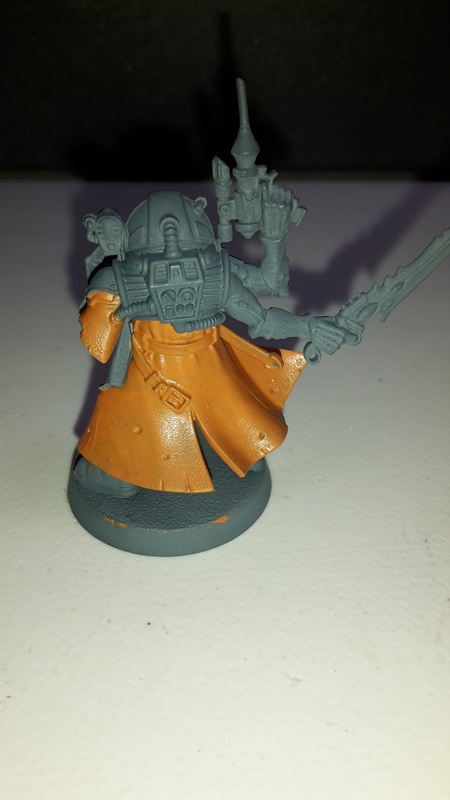 I made a slight mistake with these models, positioning the head the wrong way for the weapons unfortunately. 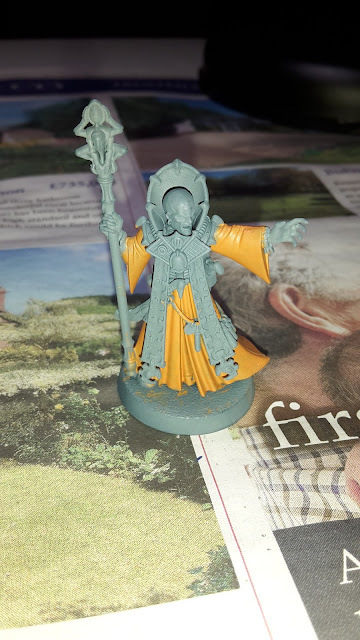 Here are some work in progress pictures of the models. This week, I was playing Cleanse and Capture (three cards per turn) with Spearhead Assault deployment zone. 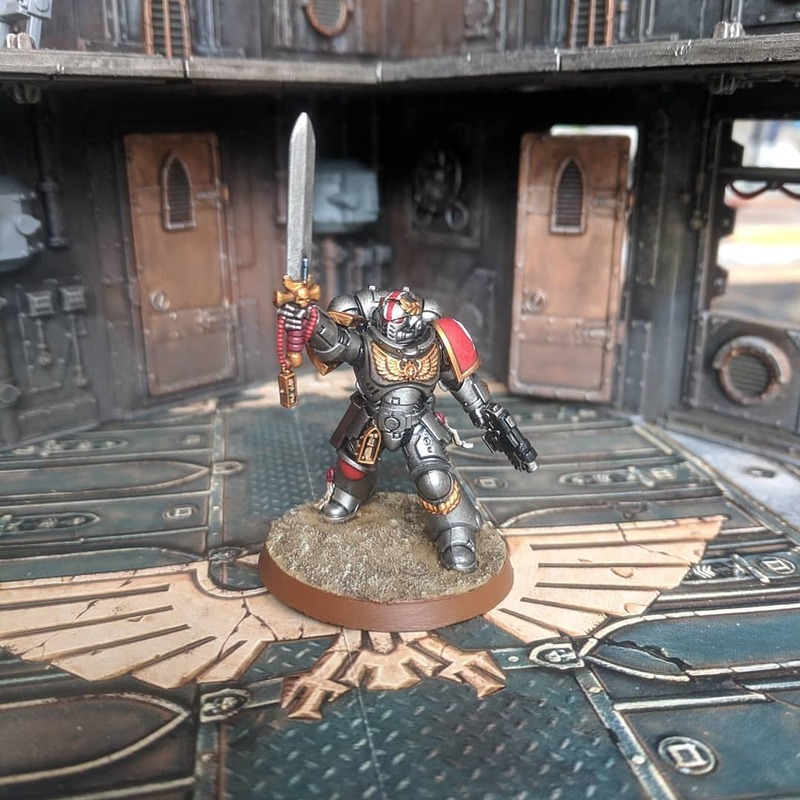 My warlord was the Captain and he took the White Scars Deadly Hunter Warlord trait. 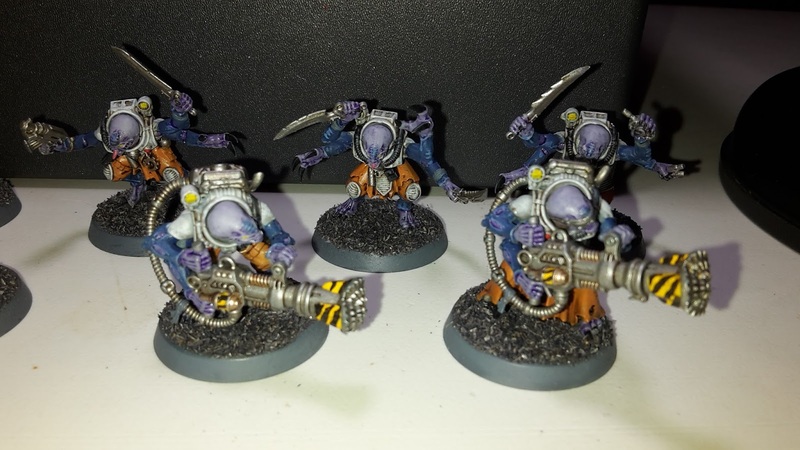 This week for Hobby Sunday, I have been continuing my work with the Genestealer Cults and have completed another unit of Acolyte Hybrids. These are from the boxed set rather than the Deathwatch Overkill box, so there is a bit more variety in the models. I decided to build this squad with two Hand Flamers and a couple of Rock Drills. 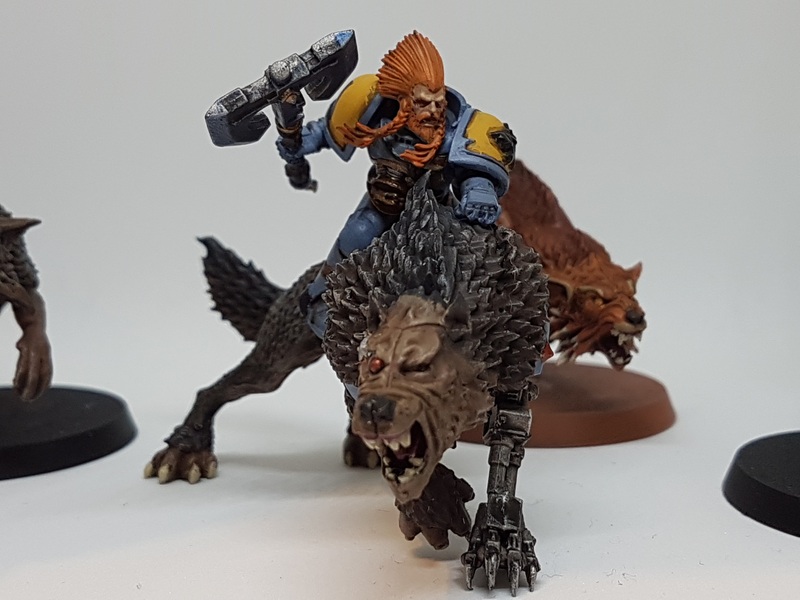 Here are some WIP shots and my completed models.